Have you ever sat through a presentation - or even given a presentation and wondered - how many more tables, pie charts or bar charts do I have to look at? Well it turns out there's a whole universe of visualization methods that most of us didn't even know existed. 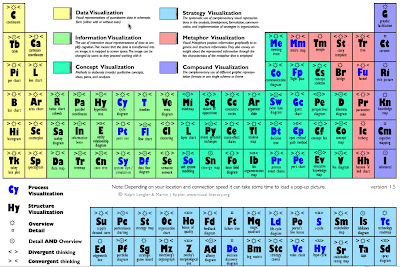 Even better, www.visual-literacy.org has created a periodic table of visualization methods to help identify and select alternative ways to present your data. Click on the figure for a high-resolution version. Notice that the figure is color-coded and uses a number of symbols to help differentiate each of the methods. The various colors allow you to quickly determine which method to use, depending on what you're trying to visualize (Data, Information, Concept, Strategy, etc) and text color identifies methods appropriate for either Process or Structure Visualization. 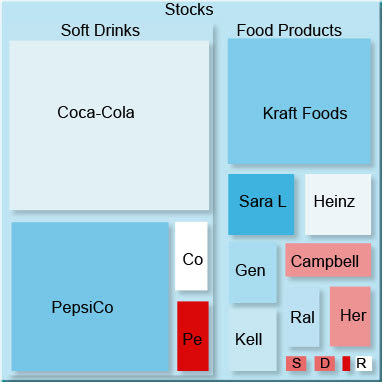 The chart is interactive - if you mouse-over any of the elements of the table, a small pop-up window will appear containing a sample of the visualization method. which according to the periodic table is used for Information Visualization, can be used to provide both an overview and detail, and represents convergent thinking. Prior to doing this piece, I had never heard of a treemap, so I did a little research - here's a great site that presents news aggregated together as a treemap. I encourage you to explore this site - it's pretty cool. 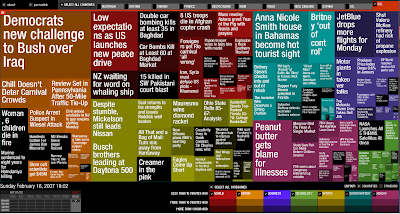 The different colors represent different types of news (World, US, Sports, Entertainment, etc); different shades of color indicate the age of the news (brighter shades are less than 10 minutes old, while increasingly darker shades are older); and finally, the size of each rectangle is related to the number of news stories found for each topic. It's comforting to see that there's a little more coverage of Congress than of Anna Nicole or Bald Britney. 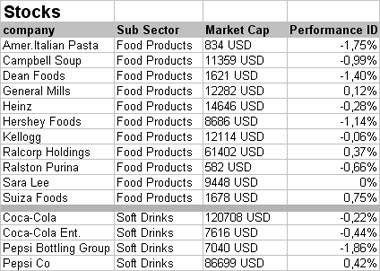 which details a number of companies, their market sectors and market caps - a measure of a company's size calculated by multiplying the current stock price by the number of outstanding shares. This is a fairly simple example - but it's not hard to get lost in a table even this small. Panopticon Software has a short tutorial showing how to go from the table to the following treemap and there's an evaluation version of their software that you can download and test drive. I think you would agree that this view of the data is a lot more visually appealing and much, much easier to understand. There's nothing wrong with tables, but take a look at your data and at some of these techniques - could your students (could you) benefit from a fresh new view? It's worth a shot! In future postings, we'll revisit the periodic table from time to time and examine some of the other methods in greater detail. I've been watching the video embedded below - sort of obsessively. The background music is nice to listen to, but I'm fascinated by this machine - so much so, that I've been sharing this video with my students and my colleagues. The video shows a working prototype of a Contour Crafting machine. The name doesn't provide much help trying to figure out what this thing does. Is it a fancy pair of scissors? Or maybe a laser-assisted plastic surgery machine? No neither. Contour Crafting, developed by Dr. Behrokh Khoshnevis of the University of Southern California, is a layered fabrication technology that could automate the construction of whole structures and sub-components. Imagine in the near future building a single house or a colony of houses (see video below) in just a fraction (1/200th) of the time that it takes using conventional techniques. The implications for disaster recover [think hurricane Katrina] and low-income housing are mind-blowing. You might ask - what does this have to do with teaching and learning? It's pretty simple. When I show this video and this technology to my students (CADD and Engineering) it engages them and sparks their imagination. So much so, that I have to cut the discussion short so that we don't use up all the class time talking about this and nothing else. What does this do for me? Well besides the excitement and engagement that it generates, it gives me an opportunity to introduce important topics, such as the social impacts/benefits of technology, community service, service learning, poverty and two of my favorites topics - creativity and innovation.